The legendary bear is one of the toughest animals in all of Red Dead Redemption 2, and this guide will show you how to track it down. Arthur Morgan first encounters the legendary bear of Red Dead Redemption 2 while exploring with Hosea Matthews in Chapter 2 of the game. In this Red Dead Redemption 2 legendary bear guide, we'll be walking you through everything there is to know about the incredibly tough creature, including how to get the legendary bear pelt in Red Dead Redemption 2 with ease. If you instead need anything else to do with hunting in Rockstar’s latest game, you’ll want to head over to our Red Dead Redemption 2 hunting guide. On this page you can find all the essential hunting tips and tricks you need to know, and much more. We've also got an overview page on how to get perfect pelts in Red Dead Redemption 2. To start with, you’ll want to head to the map point pictured just below, which is home to the legendary grizzly bear. This is the spot that you visit with Hosea Matthews during your debut hunting mission in Chapter 2, and if you didn’t opt to stay behind then and hunt the bear by yourself, now’s your chance. To track down the legendary grizzly bear quickly, you’ll want to use the ‘detective’ vision of sorts that Red Dead Redemption 2 features. Press in both the left and right analog sticks, and you’ll be able to scan your surroundings for any clues as to the location of the bear. Your first clue is a little north from the main path, where you can find some broken sticks. 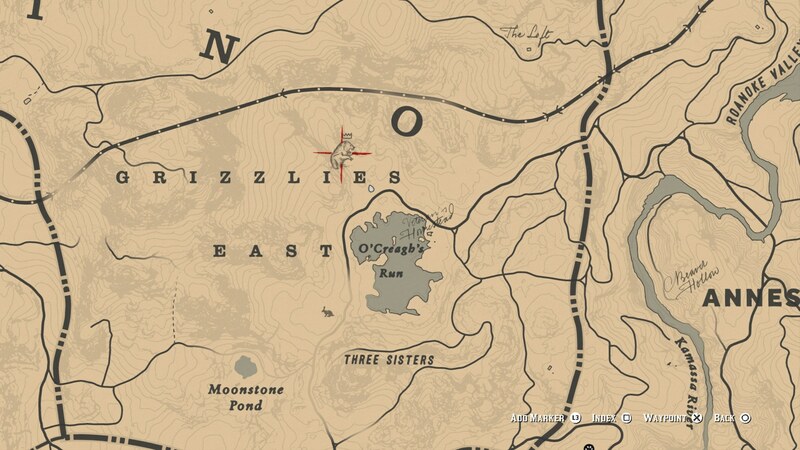 Finding the first clue to the legendary grizzly bear pinpoints a circle on the map, which indicates that the legendary animal is inside this zone. You now need to return to the detective mode, for there are two others clues you need to find in order to pinpoint the exact location of the legendary grizzly bear. But once you’ve actually found the beast, don’t worry about attempting to preserve it by using weaker weapons. This might preserve the pelts of smaller animals, but it doesn’t matter what weapons you use when facing off against legendary animals, as their pelts can’t be harmed by use of excessive force. We hope you’ve got a strong stomach, because next you’ll need to skin the legendary grizzly bear. 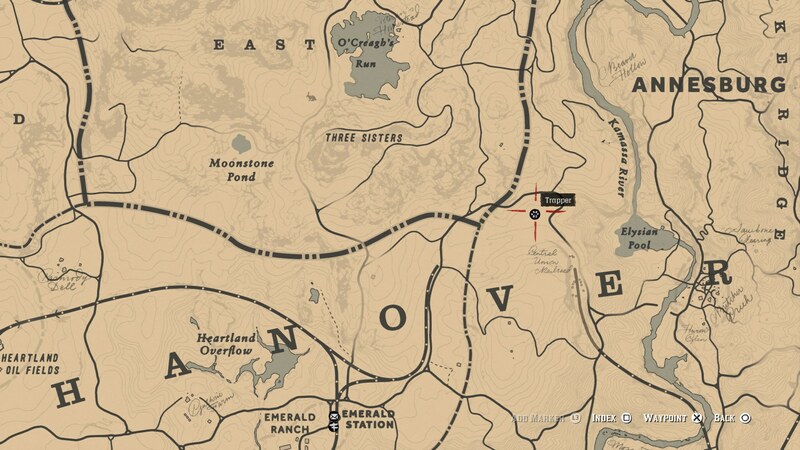 With the pelt in hand, load it onto your horse, and go visit the nearest Trapper on the map, the location of which you can see marked just below. 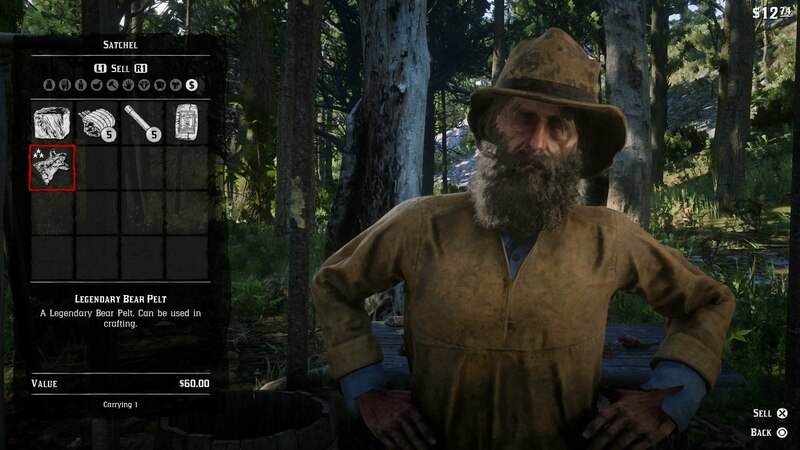 When you’re at the Trapper, speak to the animal merchant, and you’ll find that you can net a quick payday with the legendary bear pelt for $60. Do this, because selling the legendary pelt to the shopkeeper lets them use it to craft items for you. Legendary Bear Head Hat - Costs $40 and Legendary Bear Pelt - protects you from cold climates. Legendary Bear Coat - Costs $28 plus, Legendary Bear Pelt, and one perfect bison pelt - protects you from the cold. Legendary Bear Roper - Costs $34 plus, Legendary Bear Pelt, and one perfect bull hide - good in hot weather. Now that we’re all done with this guide on how to track down and defeat the legendary bear in Red Dead Redemption 2, you can head over to our legendary animal locations guide, where we outline the location of every other elite animal in the game.